I admit it. I have a girl crush on Kate and Courtney, owners of the Fibre Company. I love their product. I love their designs. I love their blog. I love the way they make their knitwear work with real life. Check out the Fibre Company blog to see how they are using the website Polyvore to showcase their finished projects. Have fun playing with the create section! 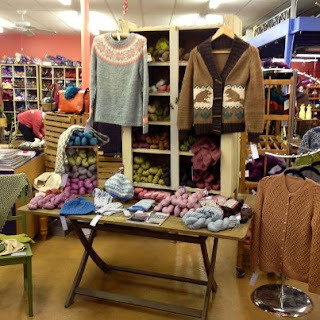 We have the Vintage Modern Knits trunk show here until February 21st. Everyone has been ooing and ahhhing over the softness and beauty of this wonderful collection so stop by if you haven't yet. We will be receiving another garment trunk show the beginning of March. This show will feature the garments from November Knits. Our Fibre Company yarns will be restocked to coordinate with the March show.